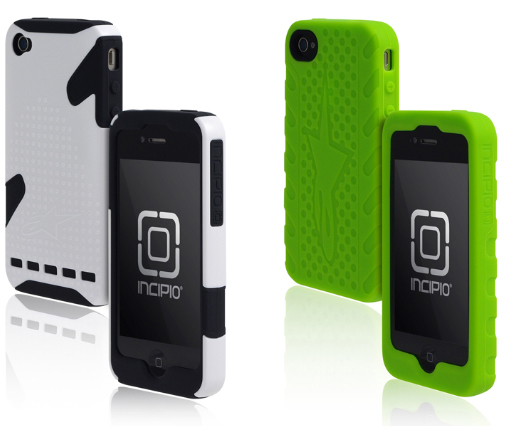 Incipio collaborated with Alpinestars and released two new cases catered towards the fast and the furious amongst us. The Tech 10 for the iPhone 4 pictured in green is a dermaSHOT silicone case that features the Alpinestars pattern and has an anti-static coating to help prevent lint from sticking. The Tech 10 case is now available and comes in five colors for $24.99. The Alpincestars Bionic Silicrylic for the iPhone 4 is a two-piece hybrid case that features a hard polycarbonate outer shell and a silicone inner layer. The raised Alpinestars logo together with textured bumps on the back provide you with grip. The Alpinestars Bionic Silicrylic case is also available now and comes in six different color variations for $34.99.